The JPMorgan Chase Foundation is supporting Digital SkillShift as part of their philanthropic commitment to drive inclusive economic growth and advance skills-based training. “The need for digital skills has never been greater. With the proliferation of technology in all aspects of our lives as well as across an increasing number of occupations, workers need to have a higher basic level of digital skills to perform at their highest level or to compete for good jobs. Our objective with this project is to help people make the most of the new emerging opportunities technology can bring while demonstrating to employers the benefits to their businesses in upskilling and investing in existing employees,” says Hang Ho, head of the JPMorgan Chase Foundation in EMEA and LATAM. ALL DIGITAL will lead this project and work with experienced partners from three EU countries to implement the project. In Germany (Berlin) they will work with Stiftung Digitale Chancen (Digital Opportunities Foundation), a foundation working since 2002 whose aim is for the digital inclusion of all societal groups and counteracting the digital divide. In Italy (Rome) the partner is Fondazione Patrizio Paoletti, which develops scientifically based educational programmes that can help the new generations to deal successfully with change. The third partner is Simplon.co in France (Paris), a network of social digital factories in France and abroad, that have trained more than 3000 people in the digital sector since 2013. The organisations kicked off the project and joined other practitioners, employers and government representatives at a conference about increasing diversity in the tech sector through inclusive training programmes, based on JPMorgan Chase Foundation supported research and findings from Empirica. 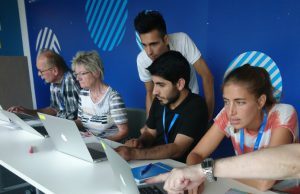 The task of the Stiftung Digital Chancen (Digital Opportunities Foundation) is to research the social consequences of digitisation, to work for equal access to the Internet for all people and to strengthen their media skills. The aim is to promote the digital integration of all social groups and to counteract the threat of a digital divide. The Foundation is under the patronage of the Federal Ministry of Economics and Energy and the Federal Ministry for Family Affairs, Senior Citizens, Women and Youth. Simplon.co is a network of 53 inclusive digital schools in France and abroad. It provides free and intensive training bootcamps for jobseekers and other vulnerable populations (women, NEETS, refugees) to help them find a job in the tech sector. So far, they have trained 3224 people with a rate of 76% positive outcomes. Simplon.co is also a rich ecosystem of digital service production, events and activities where both regions and businesses experience digital transformation. At the end of 2018, Simplon is present in 15 different countries including Spain, Belgium, Romania, Switzerland, Jordan, Lebanon, India, Morocco, Algeria, Tunisia, Senegal, Ivory Coast, Gabon and Madagascar. The JPMorgan Chase Foundation is the charitable arm of JPMorgan Chase & Co. (NYSE: JPM), a leading global financial services firm with assets of $2.4 trillion and operations worldwide. The Foundation focuses on driving economic growth and strengthening communities across the globe, by partnering with local efforts to advance skills-based training, help small businesses and improve financial capability for underserved people. The Firm, through its foundation gives approximately $250 million annually to nonprofit organizations around the world and lead volunteer service activities for employees in local communities, utilizing its many resources, including access to capital, strength, global reach and expertise.